Sharing your passions with others – Multipassionate! Discovery: my grandson loves trains. Memory: so do I. Juxtaposition: One of my passions is taking my grandsons to the Railroad Museum. This is an amazing place, full of wonder and passion. Are trains on my list of passions? I’ll have to check. The list changes all the time. Does this happen to you as well? Some of our passions are constant; others change. Some drop off, some are added. But all of them are part of the Rainbow Life. Sharing one of the my long-term passions with my oldest grandson is one of the biggest joys of my life. 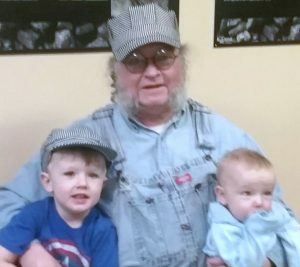 His mother, my daughter-in-law, told me that when I got a membership to the Railroad Museum so I could take him as often as I wanted, it was one of the greatest gifts I could have given him. I replied that it was just as big a gift to me as well, as I enjoy it every bit as much as he does. What’s a passion you can share with somebody? Might be a friend or relative, might be a group of like-minded people. But somehow, sharing a passion, especially with someone you love, multiplies the joy. There can be inconvenience, obstacles, even good reasons not to do it, but isn’t that true of most of the really important things in our lives? Make the leap today. Take your sweetheart on a date, even if you’re busy. Play with your kids. Write your parents an actual, handwritten letter (I was surprised how much my eighty-something parents enjoyed this.). Think of one of your passions and how it might involve other people, and just step out. You’ll be glad you did. Love to hear your stories. Post your experience below so we can all be inspired. Being Multipassionate is your super power!